Sometimes taking it apart actually isn’t easy. 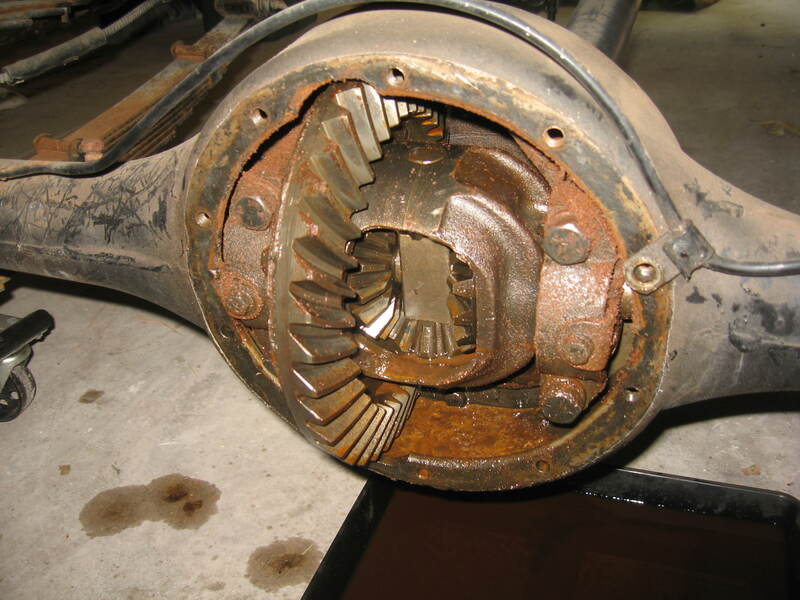 Last winter, when my dad called me to tell me the rear end was so locked up that the truck had to be dragged onto the flatbed, I got off the phone and looked up what the assembly looked like. Torque tube rear ends have a bunch of extra bearings, some complicated assemblies, and lots of tapered splines etc. I wasn’t looking forward to the day when I got to work on it, but today the day came and it really wasn’t that bad. I showed up at my dads place about 11 and found him with a 6 foot pipe on the end of my 2 foot breaker bar trying to get the bolts that clamp the pre-load section of axles to the housing. The four bolts pointing out at the camera. Despite having a full plate I managed to get up to my dads place a few weeks ago and got most of the engine back together for the Chevy truck. 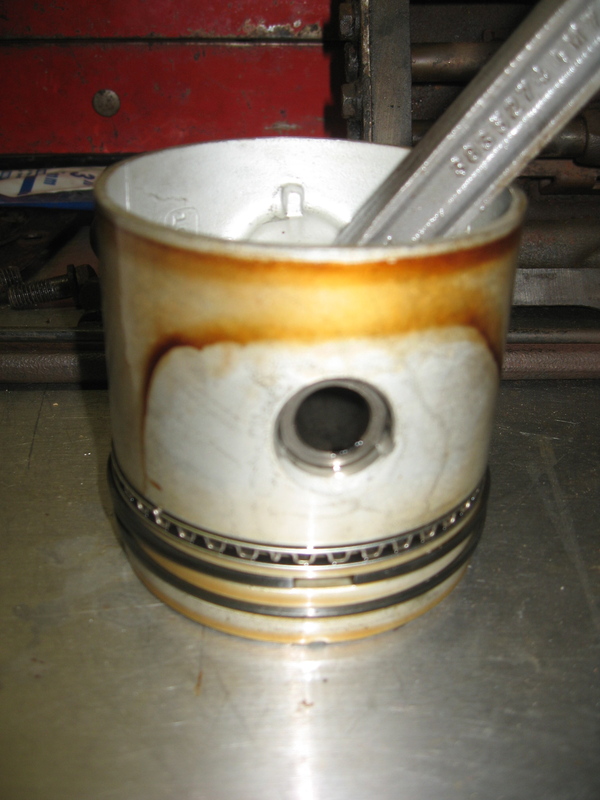 In the last installment we cleaned up the pistons, inspected the rod bearings and got everything ready for reassembly. My dad thought we would be lucky to get the pistons back in the bores -he was pleasantly surprised by how much got done. I think I will fall back on working on old vehicles for a living if my business endeavors don’t pan out. I was working along and realized I wasn’t taking any pictures so I got my iPhone out and took a few. We used the same ring compressor I use on Alfa engines to install the pistons, the same Redline assembly lube on the bearings and the same can of WD40 to wet the rings. Connecting rod caps and bolts are as expected. 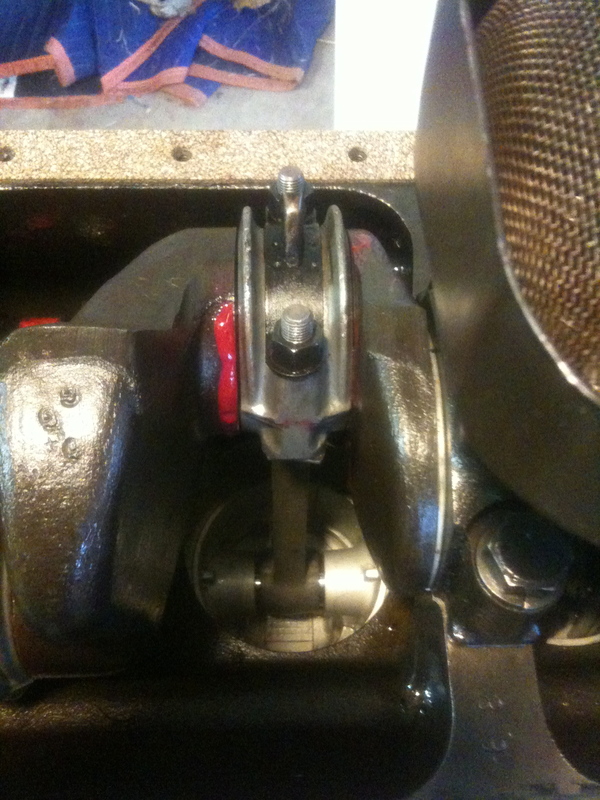 The main worry here is that the little ‘scoops’ in the sheetmetal parts that go over the connecting rod caps are oriented correctly so the turning of the crank forces oil into the scoop. I managed to get up to my dads house on Monday to grab some Sprint parts I need to help overcome a bad transmission (more later) and while I was there we spent two hours and pulled the pistons out of the 216 just to make sure there was no rust as suggested by a guy on the Stovebolt forum. You will remember the engine was stuck from sitting for years -but that I had managed with no small effort to turn it over. Something was making it stick and it’s not much work to pull the pistons out when the engine is on a stand with the head off. Why not? Nice little stain like smokers teeth. Remember the smokers toothpaste commercial -‘imagine what smoking a pack a day will do your teeth?’ I always thought -imagine what it would do to your lungs. This is what #6 looked like when it dropped out of the hole. 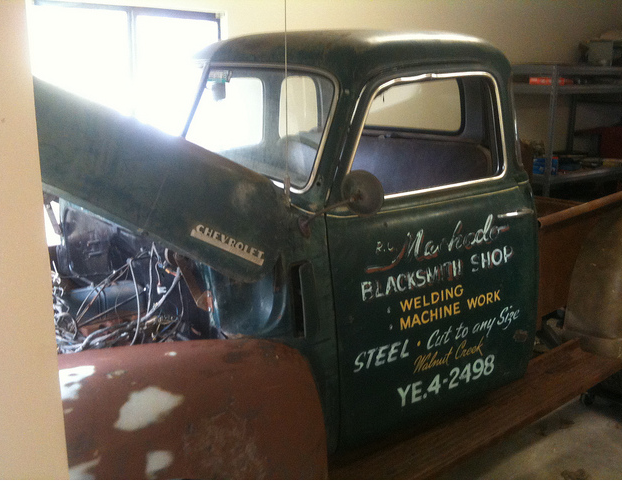 1947 Chevrolet 3100 Thriftmaster 6EPJ3165, original 216 engine, built in Oakland Ca, 65th 3100 made! Okay, I know what you’re thinking, but hey, if you like other old cars besides Alfa Romeo’s, raise your hand. I thought so. I’m not alone here. Here’s the story: around the time I was born (late 1972 for those who don’t know me outside of my ramblings here) my dad brought home this truck. It was owned since new by a local Blacksmith shop. I doubt my dad paid much for it. Over the years I rode around in it with him, notably driving several times from San Bernadino California to Bremerton Washington (some 1200 miles -just under 2000 km for my rest-of-the-world readers) for Christmas visits with my grand parents. It always started right up and got us wherever we were going. I can still remember the sounds and smells of riding in this truck -last time I was in it when it ran was probably in about 1990. This truck has been waiting a good 20 years to get back on the road. That sign on the door is pretty sweet. Funny how memories of something like this truck can be so strong when other stuff so easily fades. As a kid I would climb all over this thing and the metal was so thick I doubt I made even the slightest dent.